(Instant posting from cameraphone.) I was here. Now, were is here? This is the former Pere Marquette Bascule Bridge at the riverfront. An industrial zone for decades, the area is in the process of conversation to a park. With the site cleaned up we were able get some access to the waterfront. 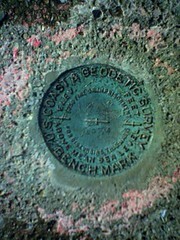 This survey marker is right at the edge of the bridge on the south-side of the Black River. 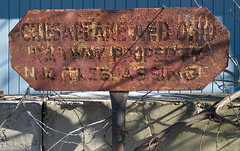 This sign sits at the edge of the park, just at the end of the current CSX yard. The touch that really made this humorous though is the barbed wire around the sign. Here is the former Pere Marquette Bascule Bridge. The bridge has been left up for decades and the tracks no longer connect at either end of the bridge. 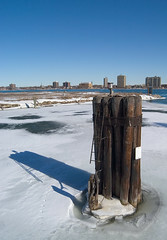 Its a distinct item along the river front and not to be missed. No need to worry about the wake now. 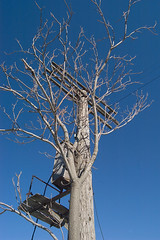 I really loved this merger of the tree and telegraph pole. I only wish I had a wider lens for this one.